The Nest Learning Thermostat 3rd Generation is the most intelligent thermostat you'll ever own and is the most intelligent addition you'll ever include in your home. Using its auto schedule feature and your phone's location it learns when you're home, what room temperature you enjoy, and when you usually go to bed, all within a week. Connect to Wi Fi on your smartphone, tablet, or laptop and control the temperature from afar. Trying to find to a balance between a comfortable home temperature and saving energy costs is tough. 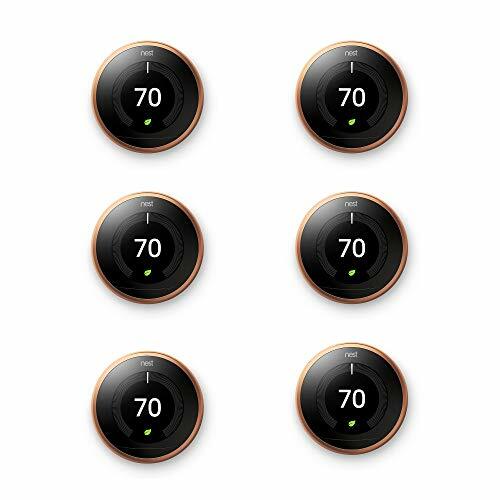 The Nest Learning Thermostat finds the sweet spot for you. It knows when you're not at home or not awake and learns to adjust the temperature accordingly. You'll know when it's using less energy when you see the Nest leaf appear on the display. It also knows tricks to keep the energy bills down, like turning on the fan to circulate cool air every so often so you're not blasting the AC all summer. It monitors your air system and alerts you when something's wrong, like your furnace is acting up or your pipes are so cold they're about to burst. When it figures out what time you come home from work, the thermostat starts heating or cooling the place down in advance so it's perfect when you get back. On average, users save 10 12% on heating bills and 15% on cooling. That means this thing can pay for itself in just 2 years! So stop paying more for energy costs and start enjoying a perfect room temperature in your home, thanks to the Nest Learning Thermostat 3rd Generation.